Christmas is just around the corner, and there’s a lot you’re probably thinking about. Dinners, out-of-town guests, gifts, decorations, vacations. Unless you went out of your way to hire a family photographer weeks ago, the “family photo” probably didn’t make the list. Come Christmas morning, or later in the afternoon when relatives arrive for some family time, it may occur to you to take a quick group photo, but more than likely, you won’t do it because at this point it feels like a hassle, and you probably have other things to do. The thing is, a group photo during these kinds of occasions is not really as hard as it might seem, even if you have a fairly big family, It just requires a little bit of forethought. And, this is one of those things that gives back more than it takes. Family photos during the holidays—photos with everyone together—become special in a way that other kinds of family images usually do not. So, in the spirit of the season, I’d like to take a few subheadings and explain how you can make that big family photo happen this year. I’m not really focused on making the photo look particularly good—what matters in this context is that the photo is taken at all. Depending on your family culture and how many other things you’re responsible for, It might seem daunting. But, it’s worth it and not at all as challenging as it might seem. The most important thing to making the big family photo happen is that it is someone’s job to pull it together when the time is right. You need to realize that a big family photo almost never just comes together. Even if you planned it out and everyone knew the plan, unless someone deliberately thinks to start reminding others that it’s time for a picture, it’s probably not going to happen. 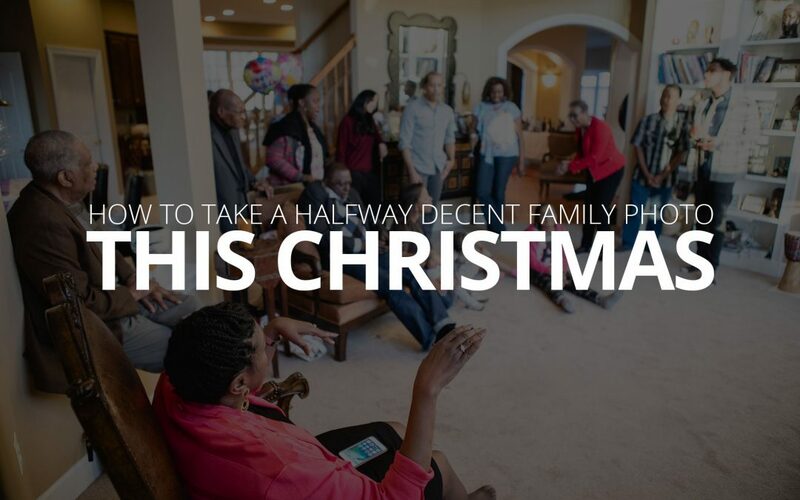 If your family is like mine and your holiday get-togethers have more than a dozen adults and almost as many children, it’s very easy to just let it slip by undone. So, someone needs to look at the family photo as their responsibility, just as others are taking responsibility for making food or setting the table. The good news is, being responsible for the photo is pretty easy—they just need to wait for their cue and then tell everyone individually where to go for the photo. Perhaps this person is you, or perhaps it’s someone else; this is a job that might be good for an older kid or a teenager. A big family photo is a lot more difficult when you spring it on people at the last second, and you’ll have a much easier time if there’s a general awareness that this photo is going to happen. But, you don’t need to rope them into the decisions, or make everyone a part of planning. That just complicates things. Instead, you just need the ‘leaders’ in your family to know about it and agree to it. If your family is full of smaller families, that means talking to the heads of those families—moms, dads and grandparents. If it’s just your family and you’re at the head of it, then you’re looking to get your oldest children aware and agreeing. It’s easier to get the younger kids to cooperate when the older kids already are. Start telling your top brass about the plan for the photo about a week or two in advance. And, whoever’s job it is to pull it all together, remind them again the night before. I don’t recommend planning the photo for the beginning of your get-together. If you do, you probably also need to make everyone involved aware that you’re planning to take a photo at that time and that’s likely to make it into a whole big ‘thing’ in people’s minds, which might end up creating some dramatic spats here or there. Plus there’s a good chance someone shows up late and you’re left scrambling through the rest of your plan, however loose it may have been to begin with. Try to pick a time where you can be reasonably certain everyone will have arrived already, and ideally when most people are likely to be responsibility-free (e.g., after dinner and before dessert). If there are small children in your life, you know that getting them all to do something can be a lot like herding cats. You might be tempted to offer up treats or consequences if they don’t behave. If there’s a lot going on, you might even be tempted to raise your voice in an effort to get them in line and looking nice for a photo. But, listen, don’t do any of those things. Don’t try and sedate them into acting the way you want them to act for a photo. This act of taking a photo should be easy, and maybe even fun. It’s not going to be perfect. It’s not supposed to be perfect. It’s just supposed to be—everyone in it, looking happy to be there. If the kids are making crazy faces, that’s okay. They’re excited about the holiday (and probably on a sugar bender). If they’re pouting, that’s going to be part of a great memory one day (as long as that memory isn’t about how mean you were). Let the kids be whoever they’re being. If you try to get the kids to behave in a certain way, taking the photo will be a stressful situation and everyone will be wearing that look on their face. Finally, now that you’ve got everyone together in one place, time to take the photo (yes, everyone has to be in the photo, even you). Use a phone clamp to attach the phone to a nearby table or chair, or just prop it up against something on a nearby table. A clamp is better though, because you can see how the photo is framed. As easy as it would be, don’t use the front-facing camera because it won’t look as good for a big group of people, and it’s not as good in low light. Make all the little kids stand in the front, and tell all the bigger kids and adults “if you can’t see the phone, the phone can’t see you”. Use the timer mode built into your phone’s camera to start a countdown. Run over to the group, pick a spot and wait for the photo to be taken. You can also use a bluetooth remote to take the photo, if you want to get fancy. Hopefully you can see that getting a big family photo every year during the holidays doesn’t have to be a huge ordeal, it’s mostly just about deciding to do it ahead and time and making a few little plans. Decide to do it, tell the folks in charge it’s happening, pick a time, don’t make a huge deal about it. That’s about it. This little, sometimes chaotic activity is so valuable, I sincerely hope you’ll make room for it while your families are together this year. Tweet us the results of your family photo, we’d love to see all those smiling faces!